Industrias del Rodamiento was founded 1958 to manufacture ball bearings for the Automotive Original Equipment. Once brand recognition was acquired in Europe, a technological alliance was established in 1973 with to manufacture wheel bearings shifting focus into the Automotive Aftermarket. acquired IRB in 1992 and maintained its sales & operations as independent business as well as IRB branding. In 2003 IRB was acquired by and started in 2005 to brand Timken®. The Automatic Tensioners patent, a product family developed by our own local Engineering capabilities, was filed in 2007 by IRB. 2010-2014 IRB is acquired by , operating under IRB brand. In June 2015 Rodamientos IRB Bilbao starts operating under 100% Spanish ownership. IRB started manufacturing bearings for the original equipment in Bilbao Plant in 1958 and focused later in the automotive aftermarket delivering worldwide. 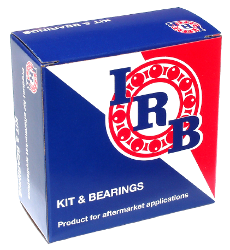 IRB Bearings design, develop and manufacture wheel bearings and tensioners, that are served in lose format as well as in kit format: wheel kit and timing belt kit.